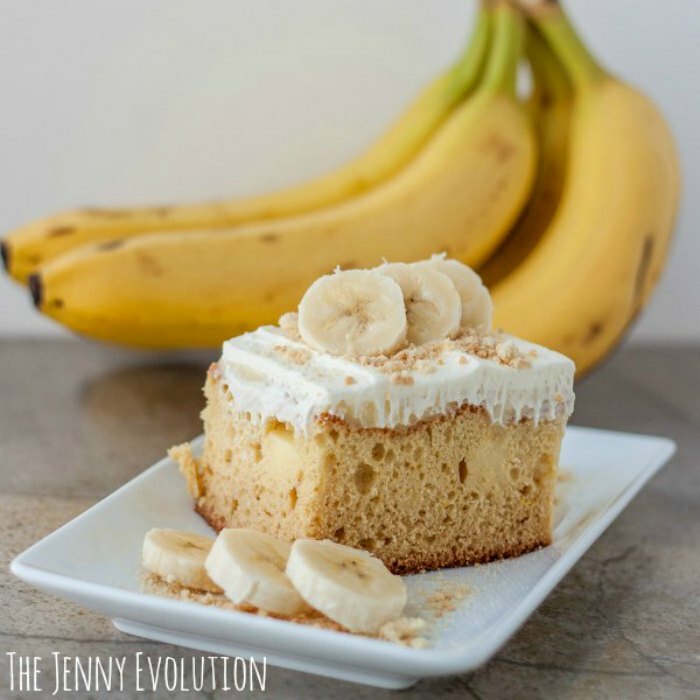 If you love bananas, this banana pudding cake recipe is a fun way to satisfy your cravings. My boys are absolutely in love with bananas, and so am I! We absolutely love banana muffins, banana bread and banana pudding. But this recipe takes our obsession with bananas one more step. 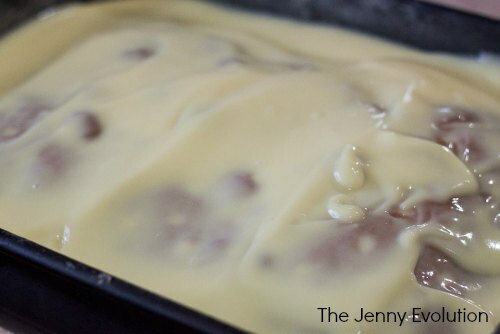 My banana pudding cake is a fun way to satisfy all of our cravings in one 10×13 inch pan. Start this cake by mixing all your cake ingredients together for 3-5 minutes, until they are well combined. Pour into a greased and floured 10×13 inch pan, and bake at 350 until the top is golden brown and a tester comes out clean. Let it cool for 5-10 minutes and then poke a bunch of holes all over it. Prepare a large box of instant banana pudding according to the regular package directions (3 cups of cold milk to one large box of pudding), but instead of mixing the entire 5 minutes until it is thickened, mix for about 2-3 minutes so its dissolved, but still very pourable. Pour it all over the cake and spread it around, making sure it gets into all those holes. Chill the cake until it is cooled completely and the pudding is set. Next whip up your cream and spread it all over the top. Crush your cookies, and garnish with the crushed cookies and sliced banana. Preheat oven to 350 degrees. Prep a 10x13 pan by buttering and flouring, or using baking spray. Put the flour, baking powder, baking soda, sugar, vanilla pudding, sour cream, eggs, oil, and vanilla in a large bowl. Mix for 3-5 minutes. Pour into prepared pan and bake for 35-40 minutes, or until the top is golden brown and a tester comes out clean. Let cool for 5-10 minutes, and then poke holes all over the cake with the bottom of a wooden spoon. Mix large box of instant banana cream pudding with milk with a whisk for 2-3 minutes, or until the pudding mix is fully dissolved, but the pudding is still very pourable. Pour all over the cake, making sure it gets into all the holes. Chill cake until fully cooled and pudding has set, about 15-20 minutes. Whip cream, powdered sugar, and vanilla until stiff peaks form. Spread on the top of the cake. Garnish with crushed cookies and fresh sliced banana. Serve immediately. I am a banana lover too, yet my boys will only usually eat them when they are cooked in something…SO this recipe sounds great and I certainly will try!! Oh please do try it… and then let me know what you think! I always love hearing people’s feedback. Nothing like temptation, right? Let me know what you think of the cake if you make the recipe. I made this for Christmas. I forgot to get the vanilla wafers, but I did have spritz cookies (red with red sugar on top), I crushed them and placed them on top instead. It looked wonderful and tasted great. For Christmas the red was appropriate, it would also be great for Valentine’s Day! Happy baking 🙂 Let me know how it turns out! 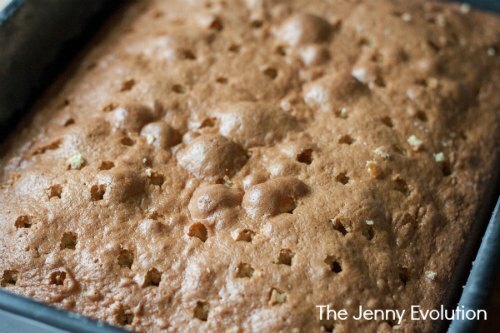 Hi Jenny, thanks for sharing your recipe on The Oh My Heartsie Girls WW this week. We do love a good cake. You found the Found & Foraged party! Thank you so much for linking up! This recipe sounds amazing! You’re welcome! And happy baking. Lands Sakes! This lovely dessert looks scrumptious to the max. Thanks for sharing at Weekend Potluck. We’re so glad you joined us. Did I miss seeing a link back to the party within your post? Doing that makes you eligible to be featured. Please join us again soon. Well, I’m certainly glad you liked the recipe 🙂 I don’t, however, believe in requiring link backs for being featured. It’s not good blogging karma, from my perspective. 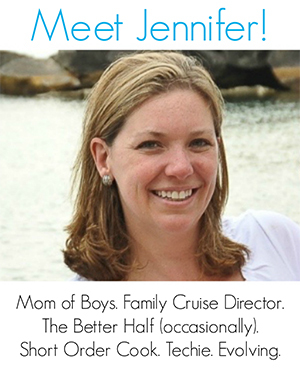 I’ve never done it on my Friday Flash Blog linky party — which has been going on for 2+ years now. Bananas are loved in our home as well. This recipe looks divine and the recipe looks straight forward. I look forward to making this recipe soon. Thank you. Happy baking. Would love to hear how it turns out for you. This sounds good. 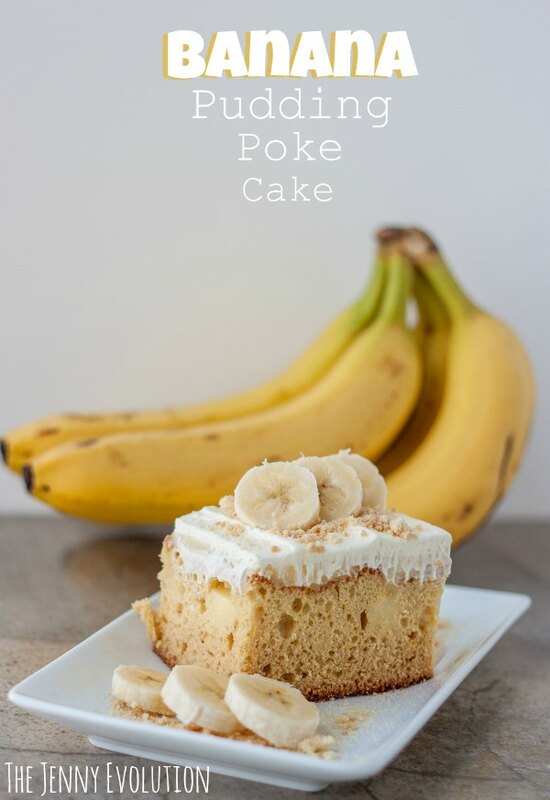 I’ve made several different poke cakes, but who does not love banana pudding! Banana is one of my favorites 🙂 Happy baking! This is my kinda cake! Thanks for linkin’ up with What’s Cookin’ Wednesday! 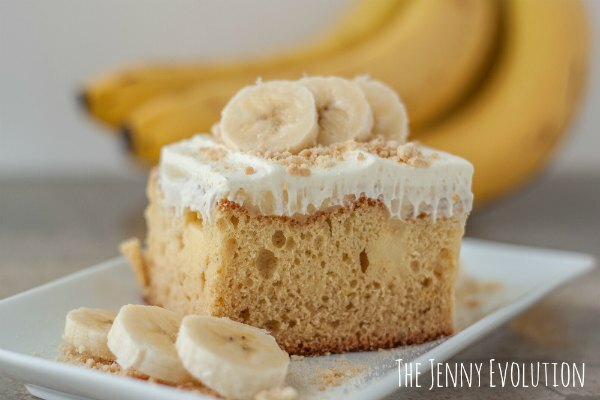 I love banana pudding and this cake looks simply delicious! Thanks for sharing with our Pretty Pintastic Party and I hope you will link up with us at Small Victories Sunday Linkup going on all week long across 12 blogs! This sounds so good! Found you at Throwback Thursday! I have some bananas that are going to go bad soon. I need to make this!